I really looked forward to seeing these two cities and their superstar cathedrals for the first time, and they lived up to their billing. Rome and Florence are not the only Italian cities that have "knock you down" awesome churches. This gallery features two impressive cities in Tuscany, each having a showcase cathedral in the spirit of the Duomo of Florence, with all the craftsmanship and stunning detail to go with it. With full color exterior mosaics these 2 historical treasures have the most colorful facades in Italy. 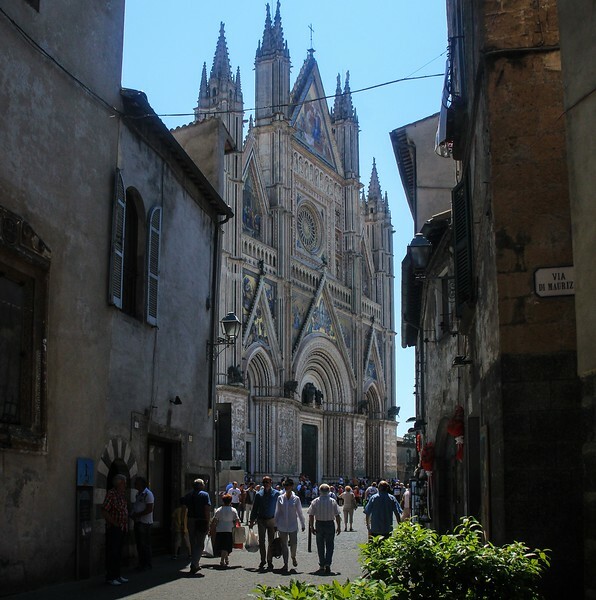 Siena and Orvieto are ancient cities with a rich history and terrific visitor appeal. Visitors cannot drive in either one-these are walking tours which have a flavor all their own. The beautiful Cathedral in Orvieto rises 7 stories above the town.